Forget What Did: ...Not to mention numbers 1 to 5. ...Not to mention numbers 1 to 5. 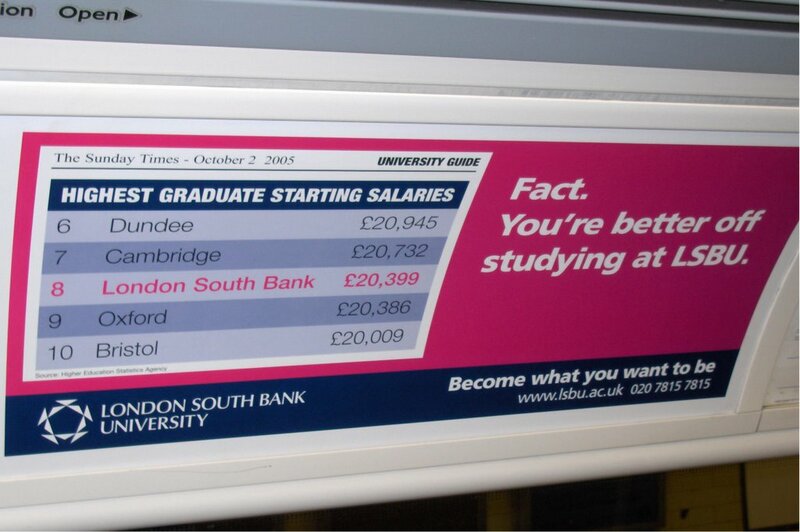 Surely the advert ought to be, "You're better off AFTER studying at LSBU"? 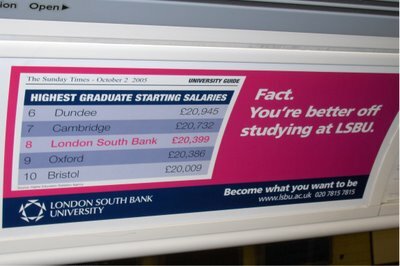 Or, "You'll be doing fine after studying at LSBU, but the Cambridge guy ought really to be getting the first round in." I don't even understand what was going through the mind of the person who made that. Did they really think people wouldn't look right above the advertised school name and see the others? Given the London Weighting allowance the fact is seeming more tenuous the closer you scrutinise it. Yes I'm going through your blog from the beginning as a means of procrastination, what of it? (Although one would hope that Google's blogging platform has long stopped emailing you about new comments, if for no other reason than to keep you sane in the face of such tremendous spam).